The second concept is based on the development of photosensitive materials based on chalcogenide glass layers for the fabrication of optical elements with spatially controlled refractive index profile. Among the available materials, we studied the parameters of thin films made with AMTIR-1, i.e. with composition Ge33As12Se55. We demonstrated that it is possible to deposit homogeneous and uniform layers associated with low losses and with thickness exceeding 20 µm. Using this layers, it then possible to photo-induce local refractive index changes exceeding 4.10-2. These layers were then used to demonstrate optical interference filters with spatially controlled spectral profile or volumetric diffractive optical elements. 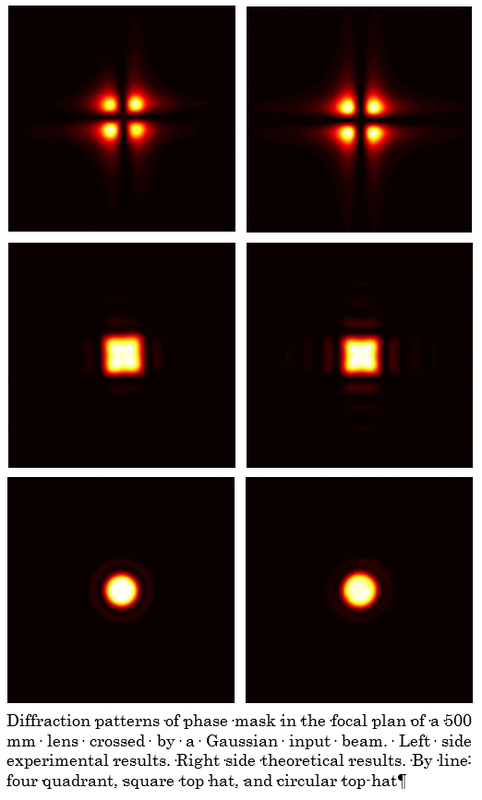 These elements were recorded using a dedicated system based on digital micro-mirror device and in-situ optical monitoring system that allows measuring the evolution of the far-field diffraction profile of these elements during their fabrication.